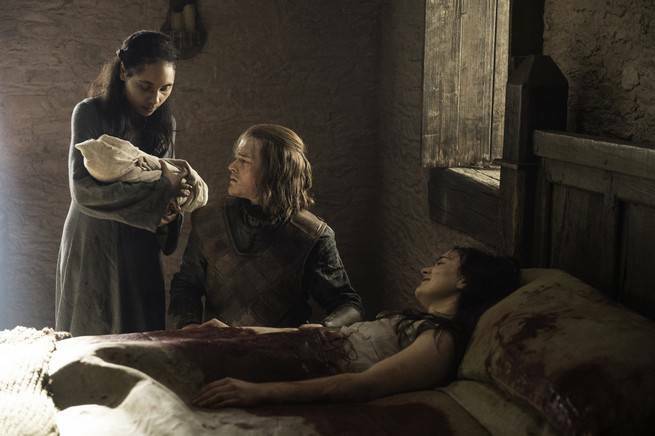 Game Of Thrones: What Does Lyanna Whisper To Ned Stark? The Game of Thrones Season 6 finale episode, “The Winds of Winter,” had plenty of big moments, but arguably the most anticipated of them was Bran’s second vision of the Raid on the Tower of Joy, an important moment in the history of Westeros that occurred at the end of Robert’s Rebellion. The second flashback took place after the battle was over. Bran saw Ned Stark enter the Tower of Joy and find his sister, Lyanna Stark, dying. Lyanna whispered something to Ned and drew a promise from him concerning her newborn child, and a hard cut to Jon Snow’s face heavily implied the child was Jon. Since “The Winds of Winter” aired there’s been some discussion among fans about what Lyanna whispered to her brother. The folks at GamesRadar have done their best to enhance the scene’s audio so that fans can hear as much as possible. What Lyanna whispers to Ned is, “"His name is .... If Robert finds out, he'll kill him. You know he will. You have to protect him. Promise me Ned. Promise me." Jaeherys would make a certain amount of sense. Many fans do not believe that Lyanna was abducted, contrary to the most widespread narrative of Robert’s Rebellion. Those fans believe that Lyanna and Rhaegar Targaryen were actually in love and that they ran away together, possibly even marrying at a Godswood in the Riverlands. If this is true, it would make sense that Lyanna would give her son a Targaryen name that matched his half-siblings - Aegon and Rhaenys. Jaehaerys is a particularly good Targaryen name since two previous and well-remembered Targaryen kings shared the same name. However, Targaryen names tend to be distinctive, as the House comes from Valyria, a distinct culture from Westeros. If Ned was going to protect baby Jaehaerys from Robert Baratheon, who was determined to wipe out the entire Targaryen line, then the child would need to go by a less conspicuous name. Jon is a traditional northern name, a Stark family name, and the name of Jon Arryn, who was a father figure to Ned, meaning it's exactly the kind of name nobody would think twice about. Jaehearys is still just a theory, though. Williams admits that she is not a great lip reader and she tells Refinery29, “I've seen some comments from people who are deaf or hard of hearing suggesting that Lyanna is saying ‘His name and house is,’ which could very well be the correct answer.” Still, a Targaryen name for a Targaryen prince seems like a viable possibility as well.